Written by Lindsey Askin, library volunteer and PhD student in Divinity. 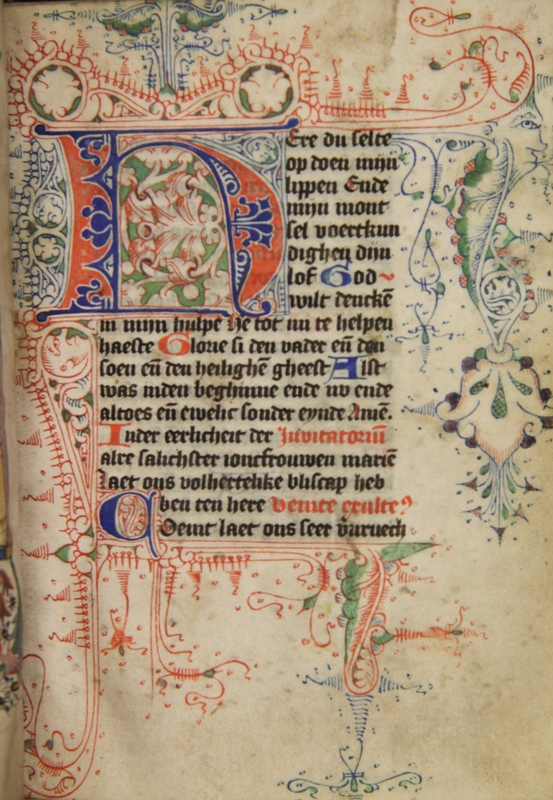 The Old Library is home to a beautiful Book of Hours from the Netherlands, dating to 1453, just two years before the first printing of the Gutenberg Bible. This manuscript, written on parchment, is very beautifully decorated with flourishing initials. The script in which the manuscript is written is known as Gothic bookhand. 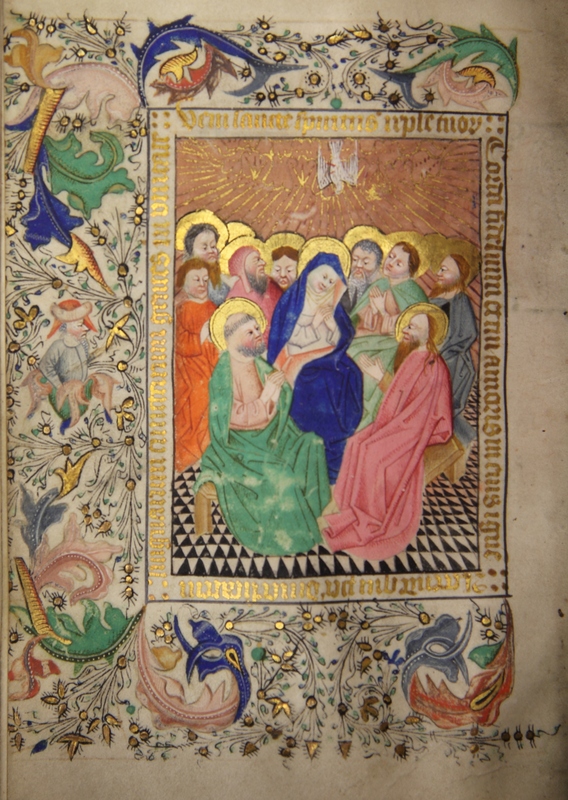 Our volume also contains seven pages of illuminated miniatures of the life of Christ. MS 50 is written in Middle Dutch. 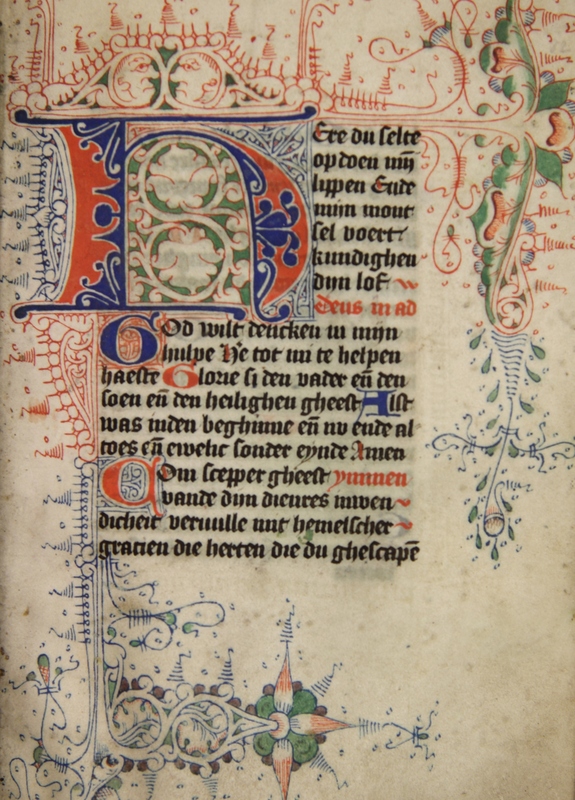 The Netherlands, along with France, were producing vast quantities of Book of Hours in the fifteenth century. The production of Books of Hours by the fifteenth century was no longer the sole provisio of monks and nuns, but was almost entirely taken over by trained scribes and artists in scriptoria, writing workshops. 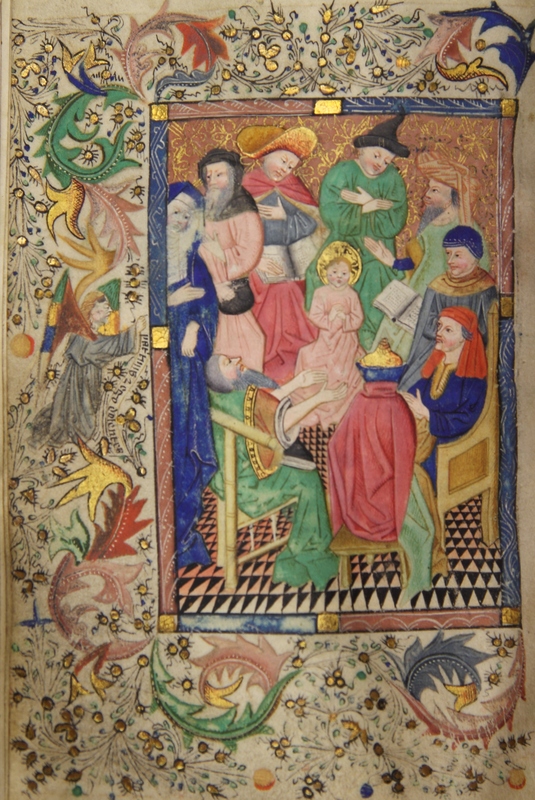 A Book of Hours is a medieval devotional book. The cost and luxury of a Book of Hours is determined largely by the number of illuminated miniatures in it. Each Book of Hours was made bespoke, but most of them typically contained the following: a religious calendar, a gospel extract, the Little Office of the Blessed Virgin Mary, the Psalms of Degrees, the Penitential Psalms, a Litany of Saints, an Office for the Dead, and the Hours of the Cross. In terms of artistic expression, the Book of Hours was the highest medium for book illumination in the late Middle Ages. The most famous Book of Hours is the Belles Heures of Jean de France, the Duc de Berry, created around 1409 by the Limbourg brothers (The Cloisters at the Metropolitan Museum of Art, New York). The Belles Heures contains ninety-four full-page miniatures, by comparison with the more modest seven miniatures in MS 50. The contents of MS 50 are as follows: fol 1r-1v Calendar of important feasts for 1454-1490, fols 2r-13v Calendar, fols 16r-55r Hours of the Virgin, fols 57r-80v Hours of the Eternal Wisdom, fols 82r-101r Hours of the Holy Spirit, fols 103r-109v Hours of the Cross, fols 112r-132v Penitential Psalms and Litany, fols 136r-181r Office of the Dead, fols 183r-189r St Ambrose’s Prayer on the Sacrament and other Eucharistic devotions, fols 189v-198r Prayers to Christ, fols 198v-202r Marian prayers, fols 202r-207v Suffrages, fol 207v copyist’s colophon. Dit boec is ghesceven int iaer ons heren. M cccc ende liij Gheeijnt op sinte augustijns avent. Bidt voer die scriven een enghelsche gruet om maria wille. The red, violet, and blue initial ornamentation found all over the manuscript is an excellent example of ‘mask-group’ pen-flourishing, a style of ornamentation which originated in Amsterdam. Many of the ornaments contains flowers and faces, many of which green and grotesque. The impressive miniatures are likely the work of the unknown Dutch illuminator known only as the Master of the Haarlem Bible (named after the Latin Bible in Haarlem’s Stadsbibliotheek, MS 187 C 13). The Master of the Haarlem Bible was active c. 1445-173, during which time he illuminated at least forty manuscripts. Most of these jobs were Books of Hours. 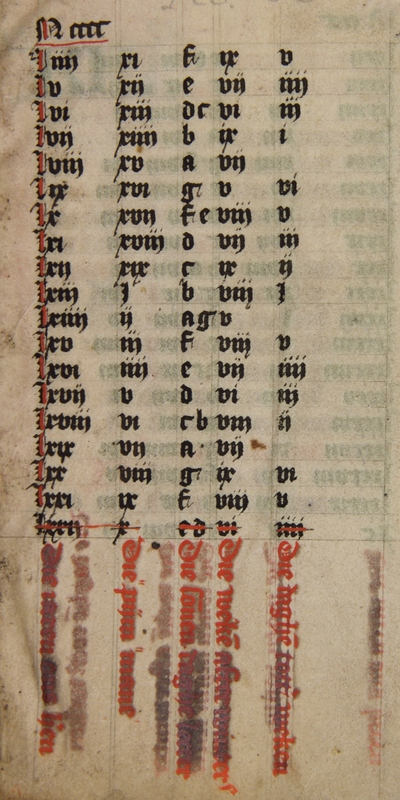 The seven miniatures in MS 50 are inserted single leaves. To facilitate the production of Books of Hours, medieval artists operated on a division of labour / assembly line basis: illuminators worked on illuminations while scribes worked on copying. In the case of our manuscript, the Book of Hours sans miniatures was produced in Amsterdam while the miniatures were done in Haarlem. This was a common process. The volume was written first, then sent to be ornamented with pen-flourishes, and finally it was given to the illuminator. MS 50 came to Queens’ on April 23, 1930 via British artist and lawyer Joseph Yelverton Dawbarn, LLM, of Liverpool (b.1857-d.1943). He matriculated at Queens’ in Michaelmas 1874, was awarded LLM in 1881, and practised law at Lancaster Chancery Court. Dawbarn received the manuscript as a bequest of Thomas Craddock upon his death (Queens’, matric. 1851, b.1832-d.1930). 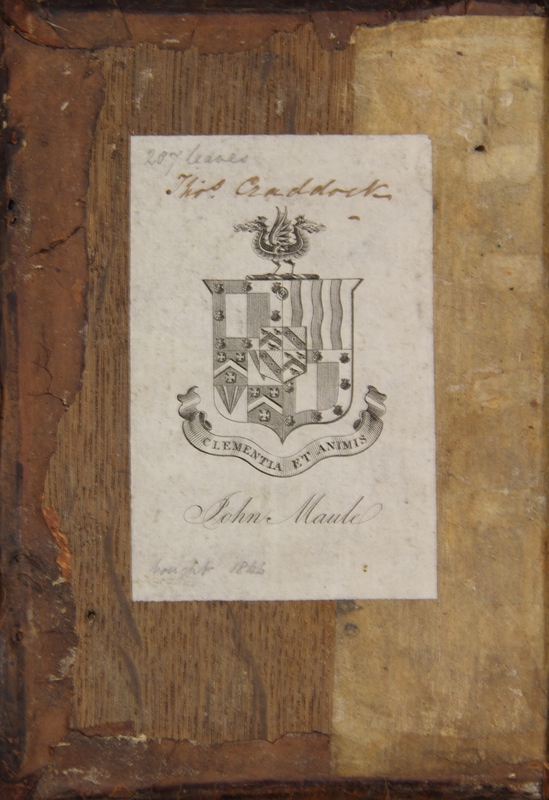 Craddock’s bookplate survives on the manuscript with the inscription ‘bought 1846’. Before Craddock, MS 50 was also owned by John Maule of Inverkeilor (b.1706-d.1781), son of Henry Maule, styled Earl of Panmure. The binding on MS 50 is very fine and in good condition. It is brown leather over wooden boards (the wood is visible on the inside of the covers) and stamped in concentric bands, with portraits of contemporary figures, some of whom are in profile and others face-on. 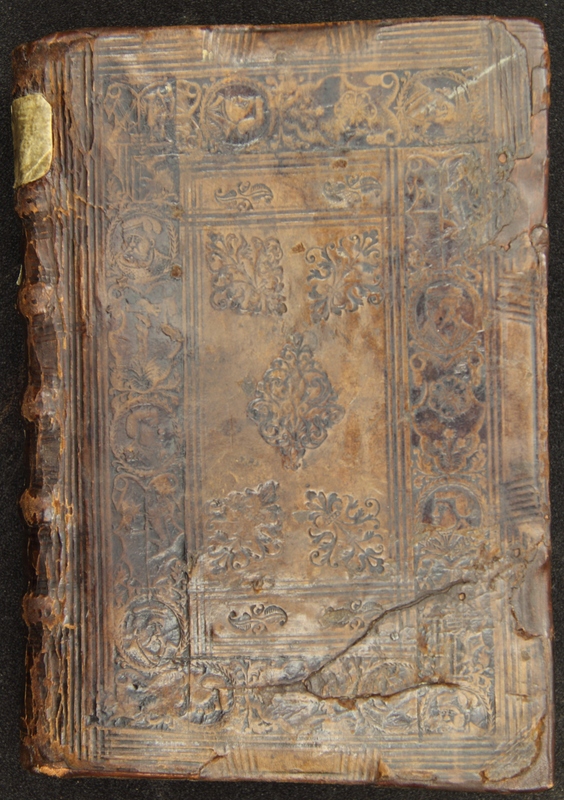 The binding contains the traces of two straps which would have locked the book shut for security, which have been carefully removed in conservation. Morgan, Nigel and Stella Panayotova, eds., A Catalogue of Western Book Illumination in the Fitzwilliam Museum and the Cambridge Colleges, Illuminated Manuscripts in Cambridge, Part One: The Frankish Kingdoms, Northern Netherlands, Germany, Bohemia, Hungary, Austria (London: Harvey Miller Publishers, 2009). Venn Cambridge Alumni Database, http://venn.lib.cam.ac.uk/Documents/acad/intro.html [Accessed January 2014].